Quantity: For each 7-quart canner load, you need an average of 10-1/2 pounds of fresh rhubarb. For each 9-pint canner load, you need an average of 7 pounds of fresh rhubarb. A lug weighs 28 pounds and yields 14 quarts to 28 quarts — an average of 1-1/2 pounds per quart. 2. Trim off leaves. Wash stalks and cut into 1/2-inch to 1-inch pieces. 3. In a large saucepan add 1/2 cup sugar for each quart of fruit. Let stand until juice appears. 4. Heat gently to boiling. 5. 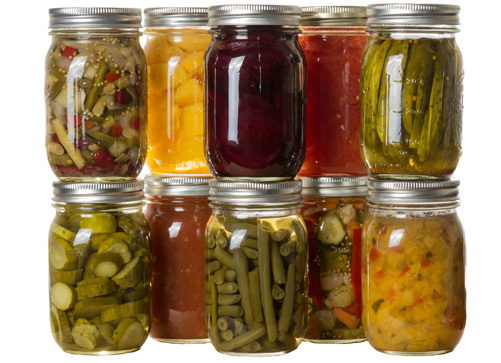 Fill jars without delay; leave 1/2-inch headspace.